SACRAMENTO, CALIFORNIA (January 11, 2018) – The Pacific Challenge Series presented by PenneyLawyers.com will honor its 2017 champion Mike Beeler and the entire series top-ten, Saturday January 27th with its annual Awards Banquet. The banquet will take place at Cattlemen’s in Roseville, CA. 2014 champion Mike Beeler became the second repeat champion in PCS history when he edged 2015 champion John Moore for the 2017 crown. He joined 2012 & 2016 champion Jeremy Doss as the only drivers to accomplish the feat. Beeler and Moore raced side-by-side for the early laps of the season finale at Roseville’s All American Speedway in October. The crowd of over 3,000 fans witnessed drama when Moore spun down the front stretch, hitting the wall driver’s door first to eliminate himself from contention on just the fifth lap of the race. Beeler went on to finish seventh and win the championship by 20 points, with 2015 Rookie of the Year Cole Moore an additional 20 points behind in third in the final rundown. 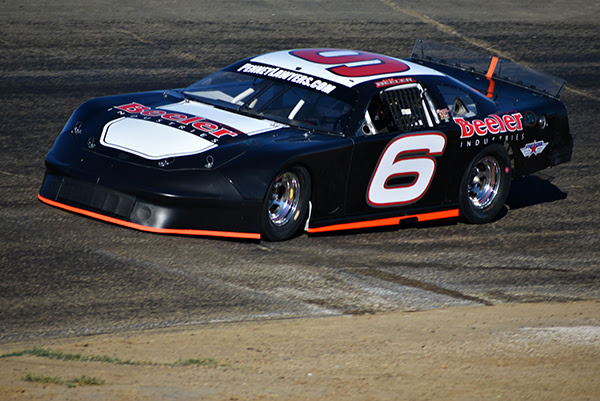 2016 Rookie of the Year Matt Wendt was the only repeat race winner in the ten race series, scoring the season finale to finish fourth in the championship. Jack Wood was a perfect 10-0 in top-ten finishes throughout the campaign, including a best finish of sixth at Stockton, to win the 2017 Rookie of the Year honors. He finished fifth in the points ahead of his cousin Travis Milburn. Jason Romero used a win at his home track in Roseville for seventh in the standings ahead of Tracy Bolin, Mike Hite, and Matt Scott rounding out the top-ten. All ten drivers will receive awards at the 2017 banquet for their accomplishments. Doors will open at 5 p.m. with a social hour before dinner begins being served at 6 p.m. Awards will follow. Dinner is $35 a plate and has a choice of ribs, steak, chicken, salmon, or pasta - with all the fixins. Competitors, sponsors, and fans are all welcome to attend. They may pre-register by calling 916-338-3434. Details regarding the 2018 Pacific Challenge Series schedule will be unveiled soon, with dates being planned for All American Speedway, Madera Speedway, Shasta Speedway, and Stockton 99 Speedway. Bakersfield, CA – Pinnacle Peak Steakhouse of Colton and San Dimas is a proud sponsor of the 2018 Winter Showdown at Kern County Raceway, for the third year in a row. The southern California based restaurant will be part of both days at the 2018 Winter Showdown, as they will sponsor the “Pinnacle Peak Steakhouse Last Chance Race” on Friday night and on Saturday afternoon they will award the Hard Charger of the Winter Showdown 300 a $1,000 bonus. The “Pinnacle Peak Steakhouse Hard Charger Award” was introduced in 2017, which will be awarded to the driver that advances the most positions from his or her original scheduled starting position. Oklahoma City, OK’s Donnie Wilson won the inaugural award by starting 23rd and finishing runner up to race winner, Derek Thorn. The format to qualify for the Fourth Annual Winter Showdown will begin with single car qualifying at 6:30pm on Friday, February 2nd. The Top 30 drivers from qualifying are locked into the Winter Showdown 300, with the fastest driver claiming the Bobby Durrett Fast Time Award and a $2,000 cash bonus. Those outside the Top 30 in qualifying will compete in the “Pinnacle Peak Steakhouse Last Chance Race”, with the Top 4 transferring to the main event on Saturday afternoon..
Friday, February 2nd is “51 FIFTY Energy Drink Opening Night” featuring Super Late Model Qualifying, Late Models, Super Stocks and the “Pinnacle Peak Steakhouse Last Chance Race”. On Saturday afternoon, February 3rd it’s the $30,000 to win “SPEARS Manufacturing Winter Showdown 300” for the Super Late Models. Bakersfield, CA – MAVTV and Lucas Oil Productions will be on hand to once again to nationally televise the upcoming “Winter Showdown” at Kern County Raceway in Bakersfield, California. The $150,000.00 Winter Showdown for Super Late Models/Tour Cars is billed as the “Nation’s Richest Short Track Race,” with top drivers from throughout North America already entered in the February 2nd and 3rd event. The two-day event will also feature the Late Models and Super Stocks for the first time. The Winter Showdown will air on a taped delayed basis, with the airdates of the “Winter Showdown 300” to be announced at a later date. Owned and operated by Lucas Oil Products, MAVTV is a television network with its roots deep in the automotive world. With an unparalleled line-up of motorsports events and exclusive automotive reality shows, MAVTV is the answer for motorheads from all walks of life. The 2018 Winter Showdown weekend will be headlined by the Saturday afternoon, February 3rd $30,000 to win “Winter Showdown 300” for Super Late Models. Friday, February 2nd will feature Super Late Model Qualifying, along with the Super Stocks, Late Models and Winter Showdown Last Chance Qualifier. For more event information, go to the “Winter Showdown” icon at www.SRLSouthwestTour.com. 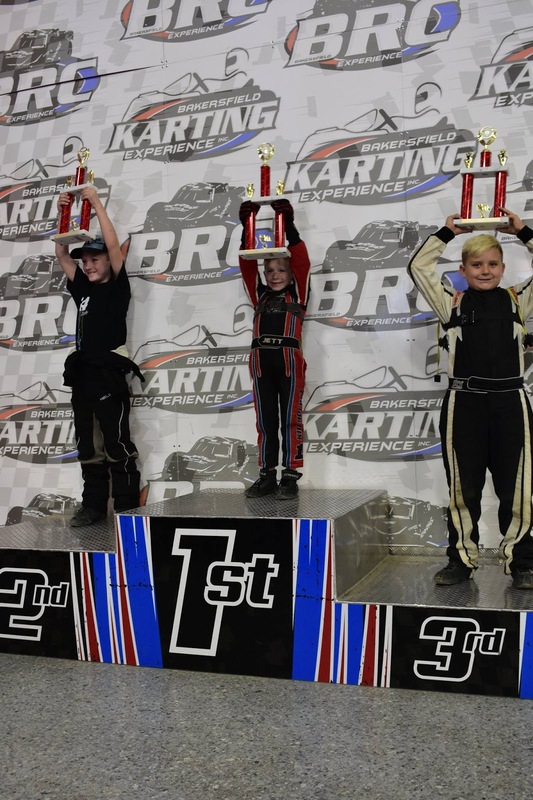 BAKERSFIELD, CALIFORNIA (January 8, 2018) – Three more drivers added victories at Bakersfield Karting Experience during its busy 2017-18 Winter Series. 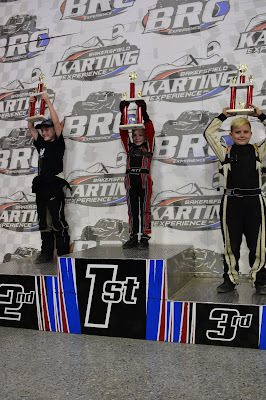 Friday night’s action for the Mini Dwarfs had three different classes competing indoors on the 1/0th mile dirt oval, with Jett Yantis scoring victory in the Sr. Mini Dwarf 20-lap feature. Jr. Mini Dwarfs and a new entry-level Jr. Jr. division also competed on Friday night. Bakersfield Karting Experience is the world’s first public indoor dirt karting oval, with rentals of karts open to the public seven days a week. The state-of-the-art facility opened up to racing competition for the fall and winter with Friday night racing for Mini Dwarfs, Outlaw Karts, and flat karts. Nine Sr. Mini Dwarfs took the green flag with Yantis jumping out to an early lead. Trenton Eurto tried to reel in Yantis in lapped traffic but could not close in enough for an attempt at a pass. Brodey Graham had an intense battle with Tyler Blankenship for third with Graham grabbing the position in the end. Yantis’ victory was his second consecutive in the venue to go with his 2017 Bakersfield Speedway championship. Bryson Martin had a similarly dominant performance in the Jr. Mini Dwarfs, pulling away after a mid-race restart for the victory. The Jr. Jr. class saw young lady driver Emma McKellar top the BKE podium for a popular win! Bakersfield Karting Experience has a busy January in store. This Friday night will be an Open Flat Kart event while Saturday night will feature another Supercross viewing party! Both events will have the full complex open including Smokey’s Pub & Grill, arcade games, golf simulator, rental kart racing, RC car racing, and so much more. Anticipation is growing for the inaugural Bakersfield Indoor Kart Nationals January 19-20. Open Outlaw Karts will race for $400 to win Friday night and $1000 Saturday night with over 30 competitors expected. Jr. and Sr. Mini Dwarfs and Beginner Box Stocks will run Friday the 19th while Saturday the 20th will have a $200 to win Clone kart feature and Box Stocks. Each night will have complete racing including eight lap heat races and 25 lap features. Entry and rules information can be found on the Indoor Kart Nationals Facebook event page. General admission tickets will be $10 for Friday night and $15 on Saturday night.